Best Missouri Grass Fed Beef: Why raw milk (whey) on pastures makes $en$e. Why raw milk (whey) on pastures makes $en$e. Just working up some research about what to do with the amount of whey I'm having leftover after converting my raw (whole) milk to cream cheese. Outside of using it to ferment and preserve vegetables, fruit, and even meat (which processes don't use all that much), I recalled some older articles about using milk on pastures to improve soil health. The only question comes up is the acidity of the whey - which is usually solved simply by cutting it with water. The additional point I would use is to also add in some Basic H so that it is more readily absorbed in the soil. For those involved in intensive grazing, I'd say to spray the pasture right after you get the cows out of it - as Basic H alone is known to facilitate the breakdown of manure (as it is an "anionic surfactant"). We always mixed water in with the milk and just sprayed it on with a sprayer. Sometimes it goes into a 5 gallon bucket, add water and an old can and it's scooped out onto individual plants. It just depends on what you're using. When we use it on the fields it's a ratio of 3 gal milk to 17 gal water. It doesn't have to be very scientific. Just prep your beds, plant and use the whey/water when the plants need watering. I wasn't aware you could overuse the whey. Hopefully this summer your garden will do better. Good luck! Here is the fig tree (in a pot) that regularly was fed the kefir and Caspian Sea Yogurt whey, and even leftover bits of the actual kefir and yogurt. I watered it in each time I applied it. It was often applied a quart at a time, a few days apart. 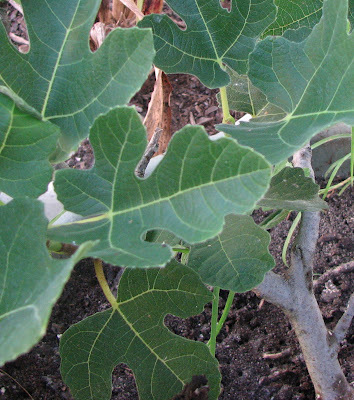 Notice the color... Below is the second fig tree -- the one that received regular watering without any whey. Hey look! 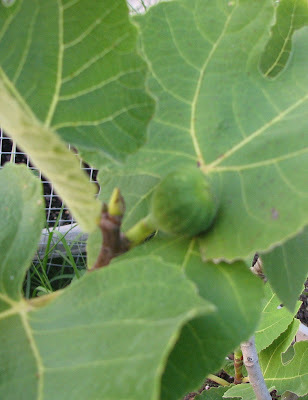 It's a cute little baby fig! Obviously it's a healthy tree...but notice the difference in the color compared to the first tree. It's particularly noticeable when looking at them side-by-side. The one fed the whey regularly is a much deeper, richer green, and the leaves are sturdier and more robust. Remove the whey from your refrigerator. To avoid any unwanted odors, strain the whey well before using it on indoor plants. Whey used outdoors does not have to be strained. Measure 1 cup of whey into the watering can. Add 9 cups of water and mix well. Use to water houseplants by alternating watering one week with the whey mixture and one week with regular water. If any plants do not seem to be responding well, discontinue the use. Put the yardstick into the bucket and pour the whey into the bucket until the level is at 1 inch. Pour water from the garden hose in until it reaches 10 inches. Using the 1 cup measure, pour 1 cup of the whey solution around the base of small vegetable plants once a week. Fertilize larger plants and trees by applying half a bucket at a time to the base of the trunk and then watering as usual. Fertilize acid loving plants, like junipers or roses, with a more concentrated solution by mixing 1 part water to 1 part whey. Wetzel began making specialty butters and cheeses that required only the fats from the milk his cows produced. This left behind large quantities of skim milk as a waste product, and to dispose of it Wetzel drove up and down a portion of his pasture with a gusher of the white liquid flowing out of a tank. He dumped as much as 600 gallons of skim milk on the field every other day. A funny thing happened. When Wetzel let his cows out to graze, they made a beeline for the patch of field that had been doused in milk. As the months wore on, Wetzel started to notice that the grass felt more supple, looked healthier and more dense in that area. In the dead of winter with temperatures dipping to negative 10 degrees, Wetzel paid a fertilizer company to take soil samples of his land. Because the earth was frozen, the worker was unable to punch a hole into the soil anywhere on Wetzel’s property until he reached the soft soil of the milk field. There, Wetzel said, the testing device went into the soil like a hot knife into butter and showed soil packed with nutrients. So Wetzel asked his neighbor, Terry Gompert, a University of Nebraska Extension educator, to come take a look. Gompert, who is not a researcher but specializes in holistic land management, called on some favors from colleagues who helped him set up test plots to put the milk hypothesis through the ringers. After 45 days, the results were startling. The plots treated with milk grew about 1,100 more pounds of grass per acre than untreated plots, a 26 percent increase in yield. Also, the soil was 18 percent softer than untreated soil according to compaction tests — meaning it had a greater “porosity” or ability to absorb water and air. More than that, Gompert said, the grass just looked healthier with fewer lesions or yellow discolorations. While stressing that much more research is needed, Gompert said the findings makes sense because milk is food for the invisible bacteria, fungi, protozoa and nematodes that teem inside a healthy soil. Raw milk is a veritable stew of protein and sugar complexes that microbes need for growth. Additionally, raw milk is one of the best sources of vitamin B found in nature and it brims with enzymes that can break down food for microbes and plants. Many farmers, Gompert said, have heedlessly scorched microbe activity in their pastures with years of tillage, chemical use and overgrazing.